Accidental Locavore: Just Because It’s a Legend, Does It Tastes Good? Just Because It’s a Legend, Does It Tastes Good? 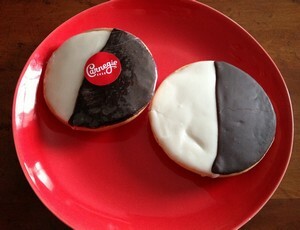 A long-time friend of the Accidental Locavore’s BFF brought over a black & white cookie the other day. For those of you who aren’t accustomed to New York’s most iconic cookie, it’s a big cake-like cookie, iced with a chocolate and white glaze. Like an egg cream, it’s the stuff of legends and a deli classic. After the ritualistic decision as to who wanted which half, we split it up with everyone getting their preferred section. This one was pretty standard deli fare, a bit dry and difficult to distinguish (flavor-wise) the black from the white. It got me wondering if these were like cannoli– was there a good black & white cookie out there, or was it just another urban food myth? There are places in Manhattan known for their cookies, but I decided to take the path of least resistance – in other words, I wasn’t traveling cross-town to buy a cookie. 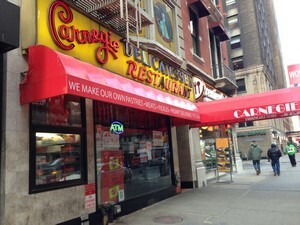 Carnegie Deli is right near my apartment, and since it’s pretty iconic, it seemed like a reasonable place to go. Their cookies are really large and very domed (unlike the standard deli fare one). For some reason, almost all black & white cookies are wrapped in plastic, and this was no exception. A cute Carnegie Deli sticker and matching napkin made me feel like it was worth my $3.50, until I tasted it. Large, dry with little or no taste (apart from sweetness), the only thing that really differentiated the chocolate side from the white side was a slight hint of lemon zest in the white icing. One bite of this was more than enough and won’t make anyone a fan. The second one came from Zaro’s in Grand Central. It was about the same size as the Carnegie Deli one, but surprisingly, didn’t come wrapped in plastic. Not quite as domed as the other one, it was moist and threatening to fall apart. The cookie part was thick and cake-like, with a decent crumb, moist and tasted like good yellow cake. There was a definite difference between the black side, which did taste like chocolate and the white, which just tasted sweet. Hands down the Zaro’s cookie was the winner and was actually a pretty good cookie. However, if all you ever get to taste are the ones like Carnegie Deli or your corner shop, there are better options for empty calories. Along with the plastic wrapped tradition, is there also one that says the chocolate icing (or fondant if you believe Wikipedia) goes on last? I hate those cookies 🙂 Good for you… I wonder if they were ever any good? Previous post: 7 Ingredients for the Best Guacamole Ever!